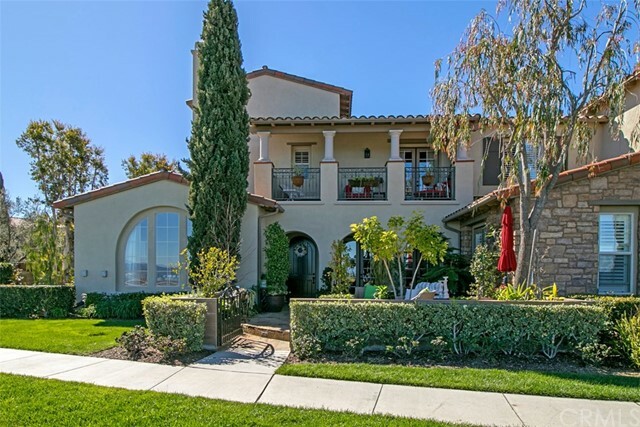 This is the "best" location in the gated community of Ziani, Newport Coast. Stunning unobstructed front row view of mountains and city lights. The largest and most popular floorplan with 3 bedrooms, 3.5 baths, upstairs loft/office and over 2700 square feet. The home provides two view patios with gated access to the community fireplace and greenbelts. Exquisite appointments include custom built-ins, Walker Zanger stone, designer window coverings, shutters, crown molding, travertine and wood flooring and surround sound. The chef's kitchen features granite counters, stainless steel appliances, pot filler and built-in refrigerator. Ziani provides a resort-style ambiance with a heated salt water pool, spa, club house, putting greens and hammock gardens. The community is located near local parks, bike and hiking trails which provide direct access to Crystal Cove beach.